I was participating in a meeting with several women a few days ago and I noticed when we began to share our goals my friends were instead sharing the actions they desired to take. These actions were all quite noble and when taken would certainly move the women forward. What I noticed, however, is when asked to what end these actions would serve, most had no clear response. There was no definitive vision. It reminded me of taking a road trip in which the destination was unclear. I’m just going wherever the road takes me! Now, I have absolutely no problem with an adventure like this and sometimes think that may be just what is needed to clear my head or let go of the every-day doldrums! However, when planning the future of your business or life, wouldn’t it be more fulfilling if you actually knew where you were heading and where you wanted to land? I work with many entrepreneurs and those who are most successful are the ones who have a clear vision of where they are going. They know exactly where they want to be, how many clients or team members they will have, what the income is, what they will do with that additional income, how they will be investing their time, what is important and how they will be remembered. Now, that is vision! There are often bumps in the road and obstacles to overcome; nevertheless, they have a target to reach; a final destination. 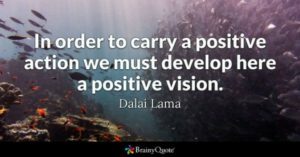 Without a vision of what the target is, how do you know if the actions you are taking are a positive influence in reaching your destination? How do I know if what I have is really a vision? Your ‘vision’ is achieved through the power of imagination! It is foresight; guiding you and providing direction to chart your course you see (imagine) yourself being; who you intend to be. It is the light shining in the darkness that illuminates your life path. Writing a personal vision statement may encompass your values, your intentions in how you will live your life. It helps to give you perspective and a touch-stone as you encounter those bumps in the road. Your vision statement is the focus and first step in your life’s journey! What would it be like to begin to chart your journey with a confirmation of all the ways you intend to live your life? Now, it’s your turn to carry out this positive action into a vision of who you are and the footprint you will leave. See it – act it – achieve it!